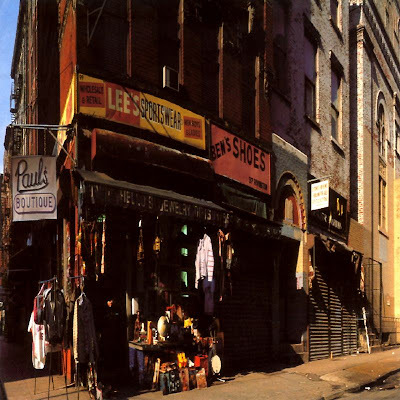 "Paul's Boutique" stands a clear ten times as interesting musically as the Beastie Boys debut, "License to Ill", was. There's very few outright rock samples compared to last time (a Beatles sample being a prominant exception) with lots of older, obscurer funk records being sampled. While the Beastie Boys themselves are still doing more or less the same boastful routine as last time, it's a lot better thought out (none of the songs are just for shock value) and while the songwriting is never really intelligent as some reviewers have claimed it is (like it matters) it is always interesting and usually with at least three things going on at once. The album really is a true feast on the ears, offering a diverse variety of music on each track. Some parts of the record, for example "Shake Your Rump" and the "Hello Brooklyn" portion of "B-Boy Bouillabaisse", point to the G-Funk sound that was so popular in the early 1990s yet the "Mike on the Mic" portion of "B-Boy..." sounds like a better produced "License to Ill". "Car Thief" is a great funky song but with very driving vocals, which gives the song a lot of energy. "Shadrach" is a triumphant, faster song that remains a total highlight of the album for me. In short, the album is so varied and easy on the ears that it's a pure joy to follow from beginning to end, making along the way revelations like "Looking Down the Barrell of a Gun" which features an original recording (I didn't say "original music") and "B-Boy Bouillabaisse", the twelve minute closing suite, which matches up a series of perfectly sustained 1-2 minute pieces successfully. The first few portions are fairly straightforward and less busy than the previous tracks, with a prominant Hendrix sample fairly enjoyable. At "Stop That Train", more prominant 'music' features alongside the vocals and from then on the song changes styles frequently and excitingly. There's not much else to say - hip hop or not, one of the most aurally pleasing records I've ever heard and you owe it to yourself to listen to it once. It's psychedelic, driven, funky, exciting, sometimes even kind of pretty (you'll see), and the boys put probably the most passionate effort on vocals they ever would. The pop culture references are myriad but more enjoyable than last time - Alfred E Neumann, AC/DC, J D Salinger and one song alone samples Jimi Hendrix, Johnny Cash, Bob Marley and quotes Stephen King. "Went before the judge he sent me to the Brooklyn House of D.
Hot wired hot wheeled and *Suzy is a headbanger*"
She woke up in the morning and her face was coated"